Composer and saxophonist Anthony Braxton has released many recordings with rather creative lineups, including one for 100 tubas, another for four orchestras, and many for various more conventional combinations of instruments. Here, he enlists the skills of veteran percussionists Tom Rainey and Tomas Fujiwara in a trio format. Recorded live over the course of two nights at New Haven’s Firehouse 12 in February of last year, Braxton and company stretch out their directed improvisations through four one-hour sets. This said directed improvisation is the result of the group following one of Braxton’s systems, Falling River Music. It might be impossible for anyone but the players themselves to know how much structure this notation system provides. Apparently, abstract painting is combined with Braxton’s graphical notation to guide (but not control) the music. Still, the listener need not consider this issue too deeply – the music speaks for itself. 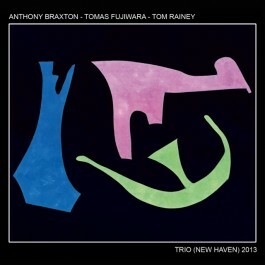 Throughout this long recording, Braxton, Rainey, and Fujiwara play together, with a few short breaks for duo work. Particularly, Rainey and Fujiwara play rhythm to one another as well as to Braxton. The first set focuses on Braxton laying down melodic structures, with the trio coming together and pulling apart around these melodies. In the second set, Braxton uses bassier instruments to evoke more growling, while Rainey and Fujiwara engage in percussion duos. The third set is more free and disjointed with Braxton focusing on the soprano sax. The fourth set features percussive rattling under Braxton’s improvisations. I often find myself exhausted after listing to a multiple-CD release such as this one. But after listening to this trio for a full afternoon, I felt refreshed, perhaps due to the variety within each set. And the music on this recording certainly isn’t limited to the descriptions above. Braxton, Rainey, and Fujiwara cover a broad expanse of styles, weaving between structure and lack thereof. Another compelling release from a living legend. ISSUE Project Room is pleased to announce the selection of our 2015 Artists-in-Residence: Lea Bertucci, Kim Brandt, Dawn Kasper, Mariana Valencia, Evan Calder Williams, and C. Spencer Yeh. Lea Bertucci will develop new works for instruments, speaker feedback, and tapes in spatialized, multichannel formats, occupying a space between performance and installation. Kim Brandt will investigate applications of choreographic method, formal and ideological systems to the body in a new dance work. Dawn Kasper will create MUSIC FOR MATTER VS ANTIMATTER, a new visual score for of bells, drums and layered analog sound. Inspired by the encounter of particles and antiparticles as theorized in particle physics, this proposed work aims to culminate into the generative development of a sculptural environment as performative composition. Mariana Valencia will develop ORIGINATORS, a movement structure for five performers denoting texture, echo, light, color, and weight. With these themes as base, ORIGINATORS can become a structure, a landscape, a commune, a voice and a vision. C. Spencer Yeh will realize new projects traversing modes of improvisation, composition, and installation. Evan Calder Williams will focus on the theme of ornament, creating a new text-based performance and video work titled The Grammar of Ornament, after an 1856 design sourcebook.